Less can truly be more. Building a home that requires less money, effort, and materials is more. A dome shelter that provides more safety in both earthquakes and severe storms is more desireable. There is a lot of talk about "green" building and "sustainable" building. Sustainability is just one of many "design criteria" that should be applied to the building of our homes. with or without prior construction experiith or without prior construction experience. This is just one of many design criteria that have evolved over a period of thirty years. Buckminster Fuller promoted "comprehensive anticipatory design". Another way to say this is, "We should think about everything when we design anything". The EconOdome building system does this. The design criteria include, but are not limited to the following. 3. Largest interior volume with the smallest surface area. 5. Built with renewable resources. 6. Good indoor air quality. 7. Adaptable to lower cost conventional items such as doors, windows, skylights, cabinets, showers, etc. 8. Adaptable to changing lifestyles. 11. Light and bright interior with plenty of windows and skylights. 13. Resiliant and earthquake safer. 14. Aerodynamic and high wind tolerant. 17. A joy to live in due to the interior layout and awesome architecture. What design criteria would you add to this list? We could add community living and increased security. Following this line of thinking we might end up: Building ten-sided dome homes and arranging them as below to solve some urban problems. or by prefabbing the individual triangles (with exterior wood sheathing attached) and bolting the triangles together. Both of these methods have drawbacks. then you will have void in the vicinity of every triangle tip. This often a problem when installing the interior triangular sheetrock panels. adjacent panels do not connect to the same framing member (strut). This type of dome would have expansion-contraction where the panels join. The sheetrock on the interior would develop cracks where the panels join. where the separate pre-fabbed triangle frames are joined. And shingling any building is difficult as there are so many shingles to install. Other dome types cover the exterior with hand applied or sprayed on concrete. This is also difficult and the results depend on the skill of the applicator. With a concrete covered dome, cracks can develop in unpredictable locations. What is solution? The solution comes from answering another question. How do you normally build a home? Answer: You cut the boards to fit. the entire dome building will be strong and have no expansion contraction problems. Why? Answer: Wood (lumber) does not change in length due to humidity or temperature changes. There is no overall expansion or contraction of the triangulated dome framework. creates an attractive and industrial quality residential dome roof. There are many proven roofing methods for sealing the exterior. We can help you by presenting roofing options for your consideration. I have found it difficult for many reasons to use metal studs for making dome home kits. Metal stud struts cannot be compound cut on the ends. This situation does not allow for alignment as the dome is assembled. And the ends of the struts do not support compressional loading like wood struts do. Metal struts also provide a conduction path for heat and cold. This is not good. And, there is the expansion-contraction (due to temperature variations) problem with metal. And, personally I like handling and looking at wood. Each piece of lumber is natural and unique. I am totally in favor of using struts made of wood (lumber) for these and other reasons. ventilation also can help with making a building more energy efficient. to allow for ventilation under the siding. And, the exterior covering on the sloping triangles of the dome can also include a vent space. 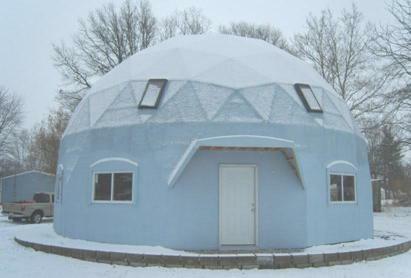 then the entire surface of a dome home can be ventilated. This ventilates heat away in the summer and provides a buffer zone in the winter. also allows moisture to have an evaporation path and purges unwanted heat. create a large area ventilation intake that also keeps the bugs out. to create a ventilation space under the entire exterior surface. An exhaust vent is installed near or at the top of the dome building. allows you to insulate within the shell cavity with any type of insulation. Spray in foam insulation works best as it fills every nook and cranny. to frame a dome roof truss. The EconOdome frame, however, has shorter and thus stronger struts. All the insulation need not be installed between the framing members. You can have a "well insulated" home using 2x4 exterior frame construction. if rigid insulation sheeting is installed outside the building frame. of nearly all homes in order to make the building rigid and stable. Then the building will be sturdy before any sheeting is installed. Realizing this allows insulation sheeting to be installed directly over the framing. to ventilate can possibly lead to mold if any moisture soaks into the sheathing and cannot dry. The solution is to ensure that all wood sheathing can ventilate. Plywood or OSB sheeting can be very useful to form a ventilation space under the siding and roofing. However, because an EconOdome building frame is formed by securing triangles at their endpoints. and criss-crossed metal straps and wires hold the building secure in high winds, deep snows, and earthquakes. and, held secure with metal screws, straps, and wires. The EconOdome building is also clad on the exterior with composite cement sheeting. the EconOdome building may be waterproofed using many proven roofing techniques. One of those commercial roofing sealing techniques is called the "saturated seal". over all seams and nail/screw penetrations. between painted on coats of elastomeric over the entire surface. exterior roof cover sheeting like DensDeck. that will keep your building materials dry during construction. is a weekend project for two people. with either conventional shingles or with large lapping TPO shingles. TPO shingles are mechanically attached (with hdg ring shank nails) and/or fully adhered with a special contact glue. 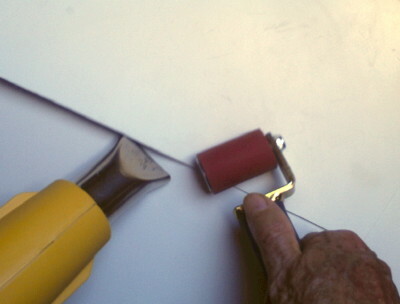 The overlaps are molecularly bonded by fusing/melting with a heat gun & small roller. for a lightweight and balanced dome, without using a massive perimeter concrete footing. using just 7 cubic yards of concrete (our mesa base floor and foundation). using 30 cubic yards of concrete that is mostly used under the perimeter of the building. And such a conventional monolithic foundation is very energy inefficient due to perimeter heat loss. As concrete costs $100 per cubic yard, this is a big difference. And using 4 times as much concrete costs at least 4 times as much in labor. Building costs are high for many reasons. Some costs we can control. with our more economical 2x4 Basic EconOdome frame kit. And you may want to consider installing a skylight near the top of the dome instead of having a cupola. Every time you make a choice it is very possible that you are adding to the cost of your home. even if you choose to always make the most economical choice. We call our product the EconOdome kit---because it can be---not because it will be. I just want to make sure you are aware of cost when you make choices. then by all means we want you to have what you want. You can build a substantial concrete floor above a retained river rock "mesa base". It is best if the mesa base is about 8 inches high and extends about 3 feet outside of the dome perimeter. The Backyard Dome is 24 feet in diameter with a 12 foot radius. This means the round and level pile of gravel could be about 30 feet across with a 15 foot radius. Rock can be easily "chuted" into place, if it is delivered by a "redi-mix" truck. on the ground prior to putting the gravel in place if this is possible. 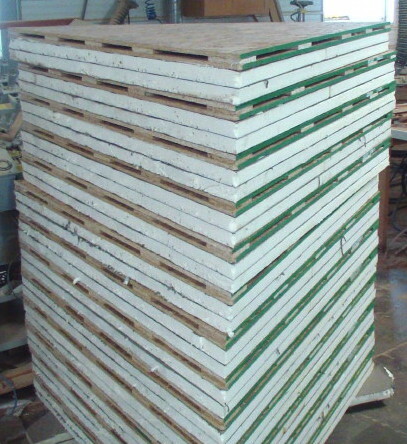 we suggest that you make a perimeter treated wood base using treated 2x8 lumber to contain a concrete floor. with the boards cut to fit and lapped at the ten corners. The top surface of these "permanent concrete forms" will be 3 inches above the gravel surface. A concrete floor can then be poured flus The "permanent concrete forms" are installed to be flush with the outside perimeter of the riser wall kit. or, that the concrete be fiber reinforced redi-mix. 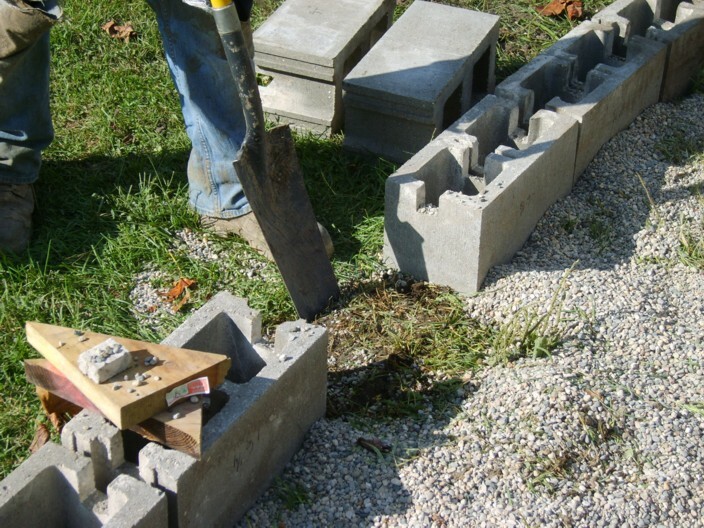 we can supply you with a "Permanent Concrete Form" kit. Now let's build an earthquake and storm safer home using some photos taken in Illinois in 2009. 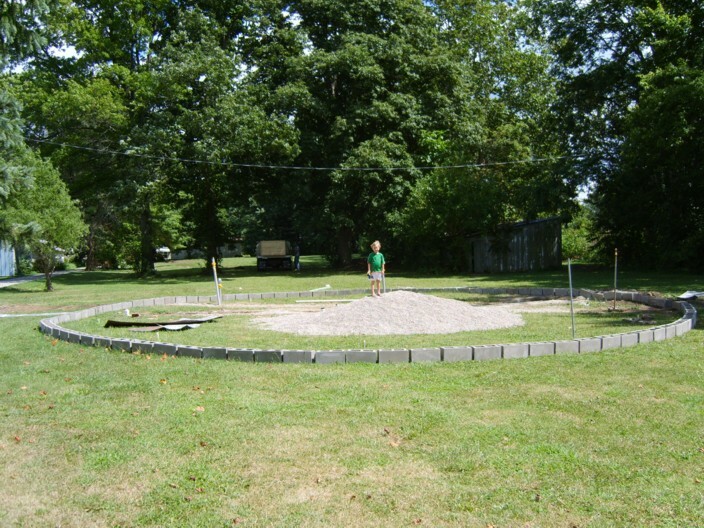 Set concrete blocks in a circle that is a few feet bigger that the dome you want to build. Level the blocks by digging out some dirt where the blocks are too high. Add extra blocks if necessary to accomodate the slope or to accomodate an abundance of rubble. Space the blocks about an inch apart. Cut notches in the top of the blocks and lay-in a ring of epoxy coated rebar. 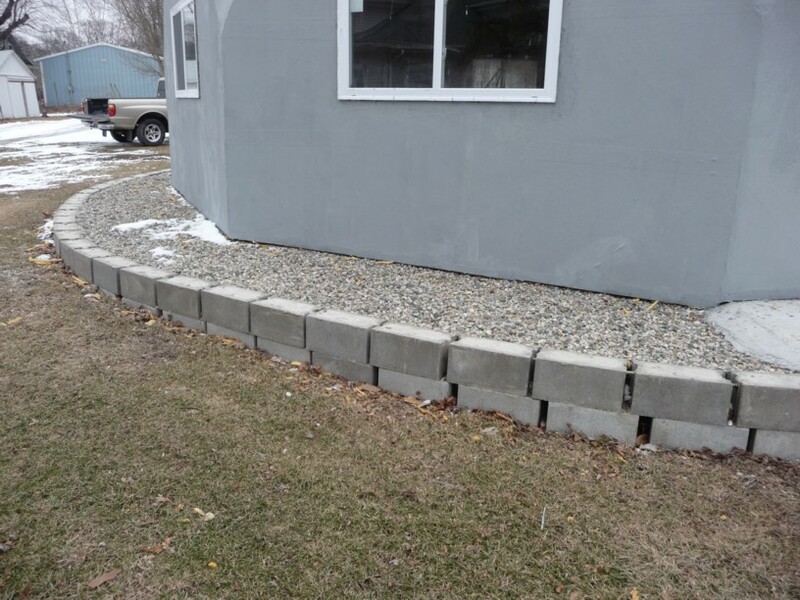 Fill the blocks with concrete to secure the rebar and blocks permanently in-place. to keep the gravel from escaping thru the spaces between the blocks. Then fill the cylinder with river rock or concrete rubble. 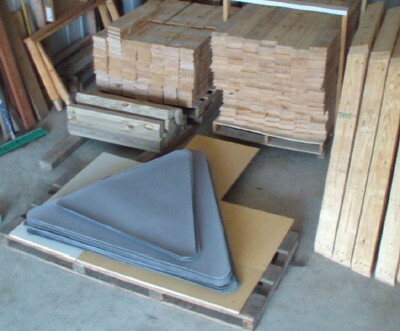 You have just created a level and raised mesa that will keep your concrete floor high and dry. 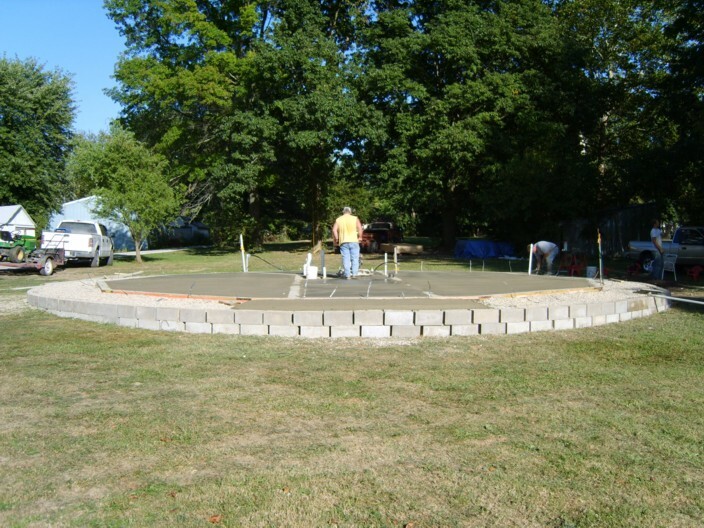 Install the permanent concrete forms and dome base using treated 2x8's lapped at the corners. Then pour three inches of fiber reinforced concrete to make your floor and secure your dome base. 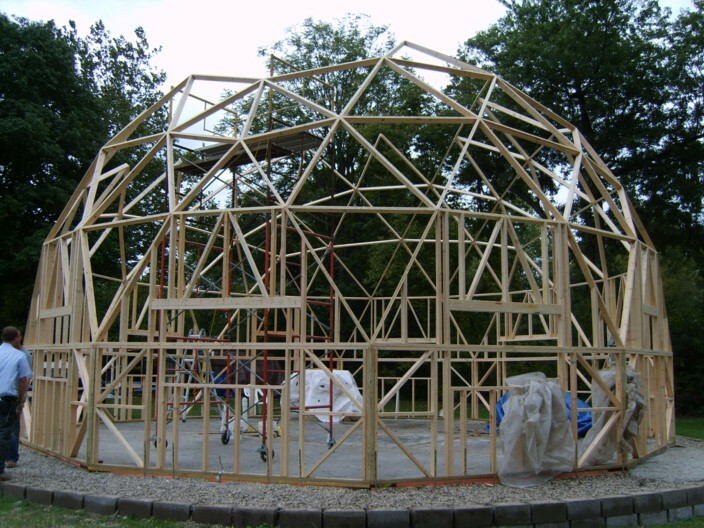 Now you can frame your dome using a precision-cut EconOdome Basic 2x4 Frame Kit. As you can see, the raised gravel mesa keeps the building dry and allows for proper drainage. A mesa foundation creates an attractive perimeter that stays dry. Buckminster Fuller avocated "comprehensive anticipatory design". can give one an uplifting feeling, and, also be--more--economical, energy efficient, and storm tolerant. Please feel free to phone our toll free # 1-888-DOME-LUV to discuss your green dream dome home. By Wil Fidroeff, co-creator of the EconOdome building system.